Do you need a gaming chair, an office chair, or a lifestyle chair? Some are very different but others look too similar on paper, which makes it hard to decide which one to get. A gaming and lifestyle chair is often the best choice as it incorporates enough gaming-related features into a stylish, upscale design that wouldn’t look ridiculous in an office setting. One of these chairs is the RapidX Carbon Line Gaming and Lifestyle Chair, which we will review for you so you can have the lowdown on its features and know what to look for in similar designs. RapidX are known for making chairs with a bit of extra width on the seat. This design policy also extends to their line of gaming and lifestyle chairs which are becoming increasingly popular. The RapidX Carbon Line chair is a good choice for any gamer. It is a solid solution if you want something that’s a bit wider than the industry standard. You might also appreciate it if you often experience shoulder pain or back pain from sitting many hours in a row. The chair is also a good fit for oversized people due to its higher than usual weight capacity. 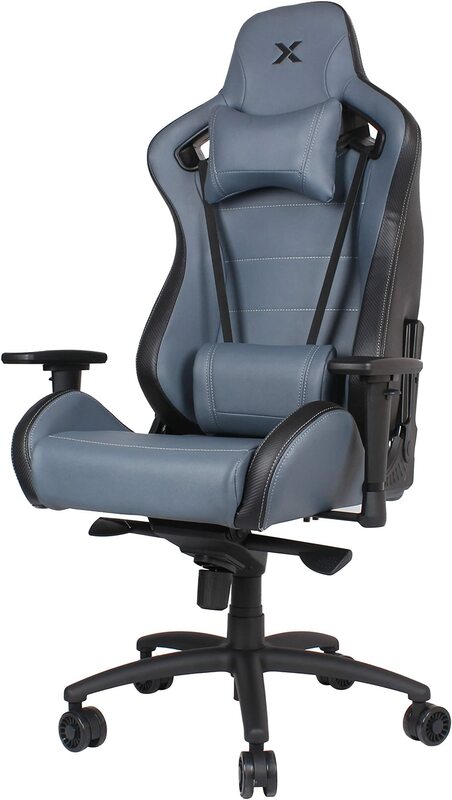 The RapidX Carbon Line Gaming and Lifestyle Chair has a very durable frame. It combines steel at the core and carbon fiber on the bolsters and at the back. The base is made of heavy-duty aluminum and features the traditional five-point star design. This gives the chair plenty of stability, as well as good traction on slippery surfaces and carpets. The backrest can be adjusted between 85 and 155 degrees. Although it’s not as much as some other chairs in this price range offer, it’s clearly more than the industry average of 135 degrees. The locking mechanism appears to be really solid and easy to operate. It has five fixed positions which eliminates a lot of the guess work and keeps the mechanism running smoothly for longer. The weight limit on the chair is 350lbs which is very high for the price range. What makes this even better is the actual design which is wider than most medium-sized gaming chairs. One minor drawback is noticeable in the choice of colors and design patterns. The RapidX Carbon Line doesn’t have any bright colors so visually they may look a bit dull, at least from a gamer’s perspective. That being said, the combination of carbon fiber and PVC leather does make the chair look very upscale and professional. Of course, by using synthetic leather over breathable fabric, you might not want to sit in it for too long without breaks. Things tend to get hot after a while. The armrests are pretty standard. They can be adjusted between 11 and 14 inches in height, but you can’t rotate them or tilt them forwards or backwards. This shouldn’t be too big of a deal unless you’re used to sitting in weird positions. Whether you’re developing an app, writing articles, recording videos, or trying to stay alive in a Battle Royale game, it’s best to keep the chair locked in the highest position. Although you can recline it to five preset positions, any recline will hinder your ability to use a mouse and keyboard. If, on the other hand, you’re using a joystick or gamepad and your monitor is positioned higher on the desk, you might just be comfortable enough to recline the chair at the first level. As stylish as the RapidX Carbon Line Gaming and Lifestyle Chair is, it’s not what you might call an all-around solution. Some gamers would rather trade the leather for breathable fabric or perhaps the extra width for customizable arm rests. If you’re looking for some of these features then perhaps the AKRacing Core Series EX Gaming Chair is a better fit. It’s a bit cheaper and comes with very soft breathable upholstery, as well as 3D armrests which you can lift, lower, tilt, and turn to your heart’s content. However, the Core Series EX does lack width so if you’re used to raiding dungeons with your legs under you, let’s just say you might not feel as comfortable. The RapidX Carbon Line is perhaps more of a lifestyle chair than a gaming chair. It looks very upscale and has a seriously solid frame. The materials used are high quality and the backrest is also adjustable. However, as you know, being able to recline a chair is not enough to make it a gaming chair. This lifestyle chair, on the other hand, has enough gaming chair features to merit attention, such as the extra seat width, wide armrests, good stability, and an ergonomic design for lumbar, neck, and shoulder support.